Great way to update a plain old shower curtain! Definitely use acrylic beaded fringe - not glass beads for this bathroom project! Measure the bottom edge of the shower curtain - from one end to the other. Pin the satin ribbon of the fringe to the bottom outside edge of the shower curtain, adjusting the ribbon so that the bottom of the beaded fringe is even with the bottom of the shower curtain along the entire length. 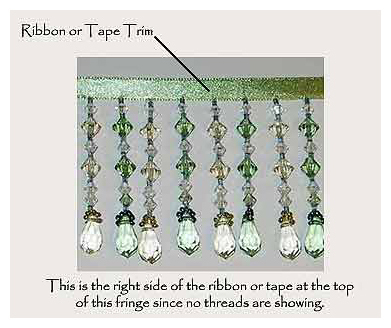 There is no right side or wrong side to the beads; however, one side of the ribbon may show threads, if so, place the "thread" or wrong side of the ribbon against the wrong side of the sheers. This will give you a nice satin ribbon edge on the shower curtain. Using thread in the same color as the ribbon or tape on the beaded fringe, stitch the ribbon to the shower curtain. This can be done on a sewing machine or by hand. If you use a sewing machine, make sure that the foot around the needle doesn't press down on any of the beads as it is moving. If you're doing the stitching by hand, take your time and be neat - your stitches will show on the inside of the shower curtain unless you have a liner. Once the beaded fringe is attached to the shower curtain, you may want to add a decorative trim, such as gimp or braid along the top ribbon or tape of the beaded fringe - it just depends on the look you want. If you do add trim, and you want to hand wash the cloth, make sure that the top trim will not fade or shrink.